You may have found some unexpected excitement in your Twitter feed this morning. That's because IBM Connect (#IBMConnect) kicked off in Orlando with a fantastic keynote announcing the new Brightcove Video Cloud and IBM Web Content Manager (WCM) integration. I've been working with the IBM Digital Experience team for the last eight months, helping them build a killer integration with Video Cloud. After plowing through our documentation, the IBM WCM product team became Video Cloud mavens--well versed in our APIs, encoding software and intelligent playback experience. They also had the benefit of speaking with enterprise organizations that already use IBM WCM and Video Cloud, studying their workflows and feature requests to inform what the integration should do, how it should work and what elements of each technology it should leverage. The result is an API integration that allows shared Video Cloud and IBM WCM publishers to use two best-in-class technologies. Publishers can now treat Video Cloud managed assets like any other assets, easily adding them to websites, conducting A/B testing and tracking the performance of the video alongside other elements of the website. 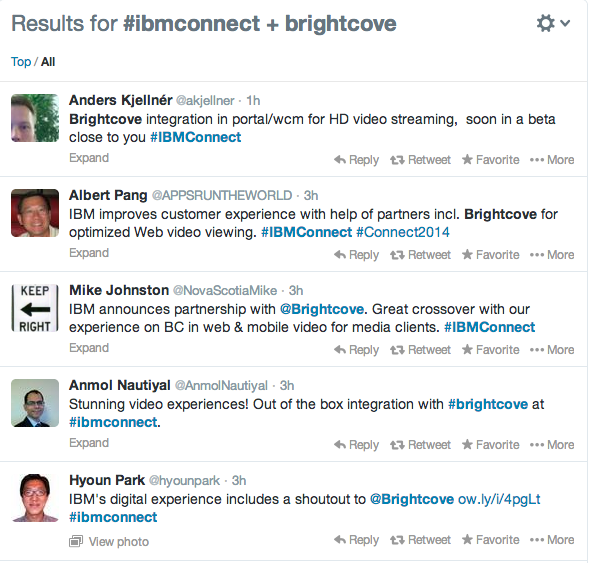 With the media token integration, IBM WCM customers can see their Video Cloud library from within the WCM UI, search for a desired video and drop it onto the page--all using the same authoring/publishing process they have in place for their other content, while reducing the cut and paste processes that so often lead to user error. Most importantly, the Video Cloud integration allows WCM customers to leverage their IBM investment in ways previously unavailable to them. Any publisher can easily drop an embed code on a Web page, but with this API integration, the full value of the WCM platform can be realized for video content. So, whatever a publisher can do with text and images, they can now do with Video Cloud videos, as well. It's understandable, then, that there was so much excitement and positive feedback this morning about the announcement. General availability is expected later this year. But, if you're already using Video Cloud and IBM WCM or are considering making the move to either platform, feel free to ask your sales representative for more information about the integration. See below for some of the reaction from IBM Connect attendees.